What we discovered from our research has led us to adopt a whole new direction. Reverse mortgages are no longer a loan of last resort for retirees. Instead, they’re a smart, safe way for you to access some of your home equity so you can stay in your home and live retirement your way. For the survey, which we carried out with market research firm, Ipsos, we talked to over a thousand Canadians. An overwhelming number of those aged 65-plus told us that it’s very important to retire at home. In fact, 93% of Canadians just like you want to stay in their current home throughout their retirement. When we asked for the reasons why staying at home in retirement is so important, maintaining independence came at the top of the list. A full 69% of you said it was the number one reason for doing so. Staying close to your family, friends and your community, as well as a strong emotional attachment to home were other key reasons for wanting to stay put. We understand this feeling. Why would you want to leave the home that you’ve worked so hard for and built so many memories in? Especially in retirement, which is the best time to fully enjoy the home you’ve built. 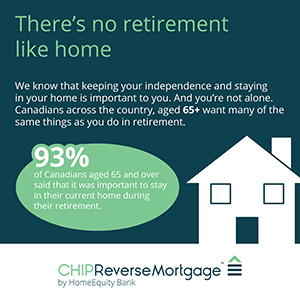 Through our new branding and our new campaign, we are celebrating Canadians who feel empowered to live the retirement they want and stay in the home they love. We think every Canadian should feel this way. Here is what Canadians like you told us they truly value in retirement. We believe that you should have the freedom to live your retirement, your way. Give us a call at 1-866-758-2447 to learn more about retiring in the home you love.